GE provides a full range of Gas-Insulated Substations (GIS) for utilities and industries worldwide. The portfolio includes GIS solutions from 60 to 800 kV, along with secondary products to maximize switchgear and network operation. With GIS experience spanning 50 years across a wide range of industries and applications, GE is a leader in the design, material selection, development, engineering, manufacturing and servicing of GIS equipment. 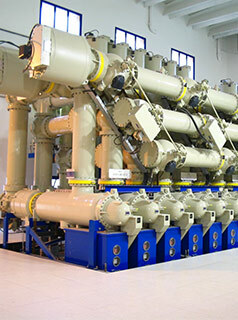 Our solutions have a long operating life span and provide customers with a high level of performance and reliability to meet a variety of operating requirements. GE's GIS portfolio includes solutions that feature some of the most compact footprints in the market, along with easily accessible, small and light weight components. In addition, many of the solutions are environmentally friendly and include low gas weights and an advanced SF6 sealing system. Full digital monitoring control and protection capabilities enable smart grid integration.